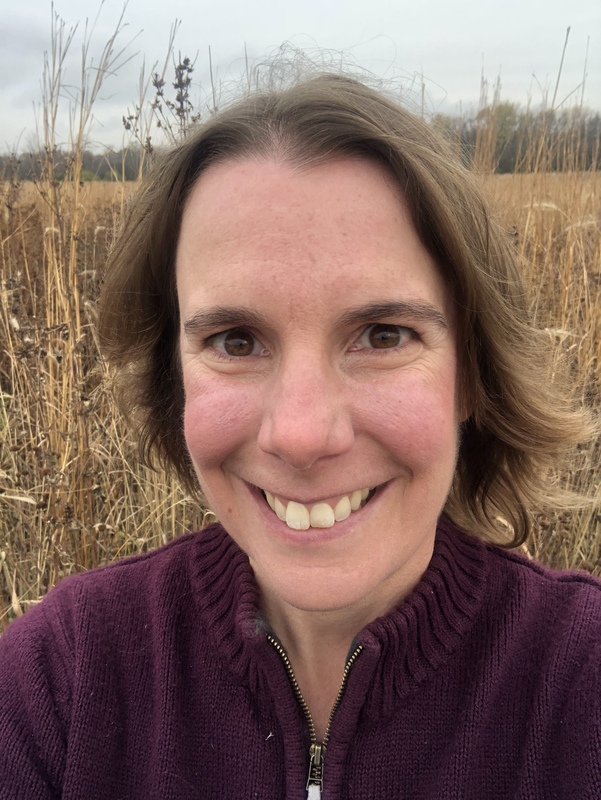 Fall is a lovely time here in northeastern Illinois. The leaves are turning, mornings are crisp, and invasive shrubs stick out like sore, green thumbs against the senescing native vegetation. Previously, Bill Kleiman has posted articles extolling the virtues of using basal bark application of herbicide as an efficient and effective method to kill bush honeysuckles [link to previous posts]. He used 15% Garlon 4 in bark oil. I have also found that treatment to be effective, but have noticed that the oil kills all plants in the overspray zone. This usually isn’t too egregious as long as you keep the sprayer pressure low to minimize overspray. The space fills back in with the surrounding vegetation within a year or so. However, there have been a couple of cases when it rained within a day after the basal bark application or it was done over snow cover and the oil washed down slope, leaving a zone of death heading down the hillside. Guess it takes oil a while to “dry”. Caption: Basal bark treatments are an effective way to kill invasive shrubs, but all plants (grasses and forbs) are killed in the overspray zone. In the fall of 2017, my coworker, Nick Budde, and I treated various invasive shrubs with different concentrations of herbicide in oil-water emulsions, to see what lower concentrations might be effective at killing the shrubs while reducing the cost of the treatment. We were also curious if reducing the amount of oil might reduce the collateral damage caused by the oil overspray. In addition, we have been wondering if it’s really important to get a full 360 degree application, since it is a lot faster to not walk all the way around each shrub. For each of the herbicide combinations, we treated half of the shrubs with a 360 degree application, walking around the entire plant and basal treating the whole stem circumference. For the other half of the shrubs, we treated them by standing in one spot, and reaching our spray wands around to spray all sides as well as possible without moving our feet. Being a former contractor, I refer to this method as “contractor-style”, but you can also think of it as an efficient application style. Regardless of application style, we sprayed the base to a height of 3-4 inches for smaller shrubs (<6’ tall or so). For larger, tree-like shrubs, we were more diligent about spraying the base to a height of 8-12”, like it says to do on the herbicide label. 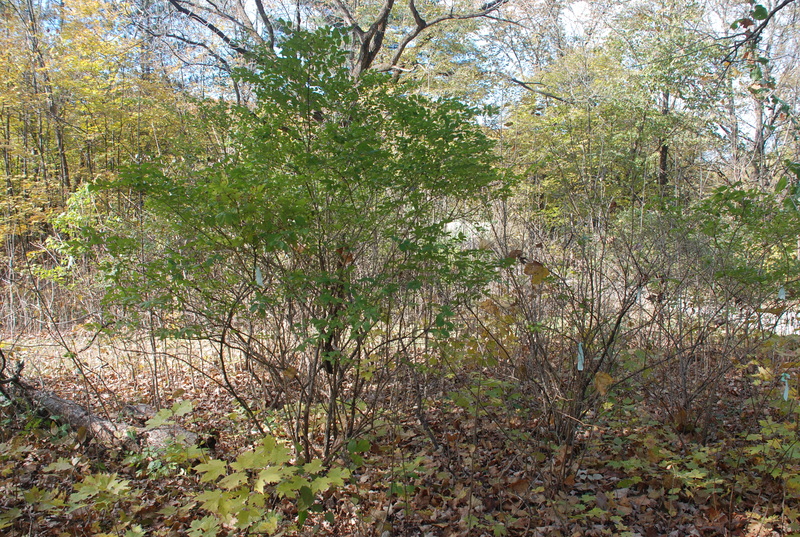 Most of the shrubs that we treated were non-native honeysuckles and multiflora rose, although there was a smattering of other invasives, including common buckthorn, winged euonymus, autumn olive, and Japanese barberry. We marked each treated shrub with a ribbon that was color-coded to the treatment type and application style. 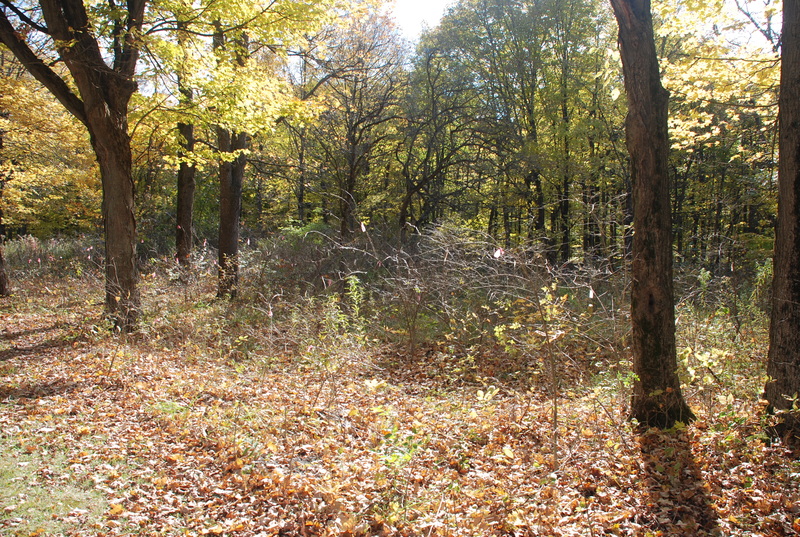 Caption: Area where the invasive shrubs were basal bark treated in the fall of 2017, viewed one year later. 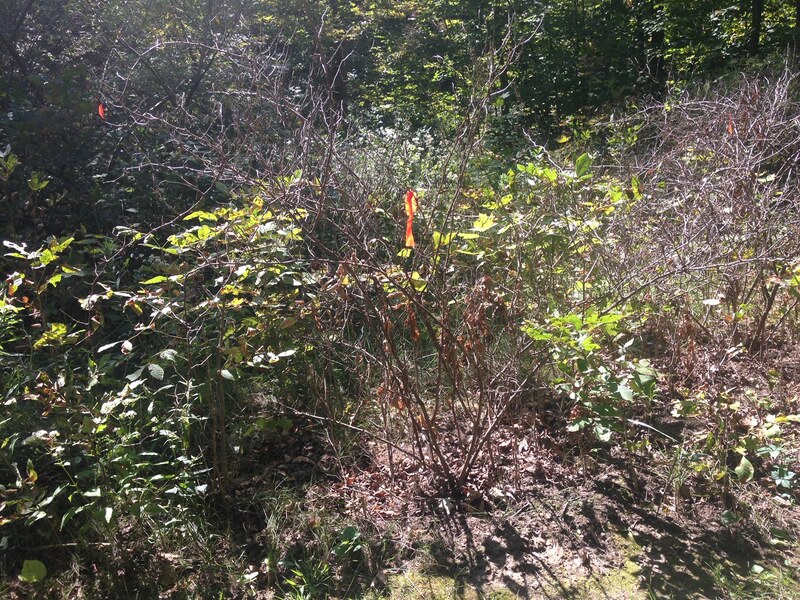 Each treated shrub was marked with a ribbon that was color-coded to the treatment type. Here were the treatment types. We used Relegate herbicide, which has the same active ingredient as Garlon 4 (ester formulation of triclopyr). The label recommends adding an emulsifier for oil-water emulsions, but we didn’t have an emulsifier so we didn’t add one. We just shook the herbicide mix back and forth in the sprayer tank for 30 seconds. We didn’t agitate it in particular after that, just walked around and sprayed. It does separate if it sits in a jug, but re-suspends into an emulsion again when agitated. There were roughly 60-100 shrubs in each treatment. 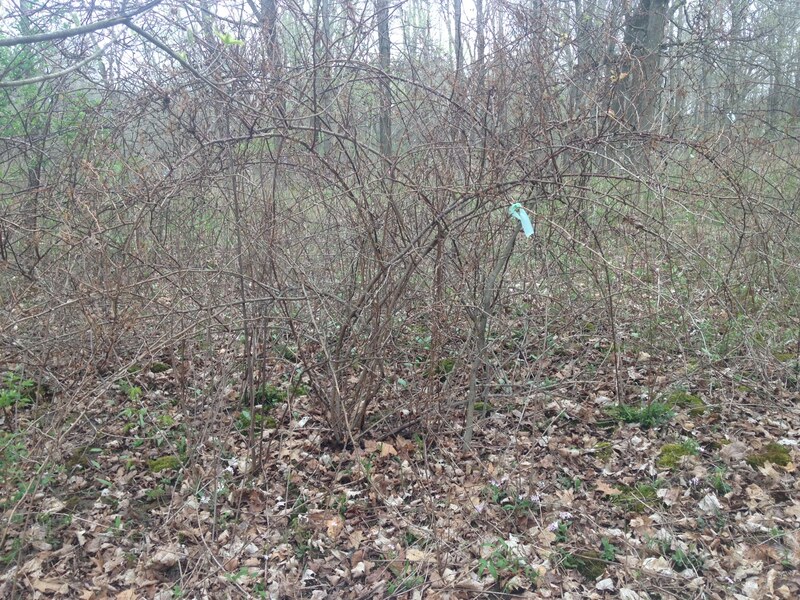 When we checked on our plots this past spring (6 MAT), we saw that the treatments had worked for the multiflora roses. Nearly all of the roses were dead regardless of treatment type or application style. This included some monster roses (8’ tall and 10’ diameter). This is great news for anyone who needs to treat multiflora rose, since trying to walk through a rose patch stinks. Handling rose canes to use a cut stump method stinks. Foliar treating those rambling canes results in a lot of overspray. Also, I’ve noticed that roses tend to re-sprout after foliar treatments, so foliar sprays often are not effective. It is nice to be able to just stick your wand strategically into a thorny mess and spray the canes at the base. The ones that were not dead were the canes that were missed. When we checked the plots this fall (1 YAT), all of the treated multiflora roses had completely died for all treatment types and application styles. Caption: All of the multiflora roses that were basal bark treated died, even the ones that were treated with only 5% Relegate emulsion and treated while standing in one place without walking around the entire plant. In contrast to the roses, most of the honeysuckles and other invasive shrubs leafed out in the spring after treatment, although they looked somewhat stressed. However, when we checked the plots this fall (1 YAT), nearly all of the honeysuckles and others had died in all of the treatments that had at least 10% Relegate, regardless of application style. The only one that did not die was a 10’ tall honeysuckle that was treated “contractor-style” with the 10% Relegate emulsion. Less than half of the honeysuckles treated with the 5% Relegate emulsion were still alive. 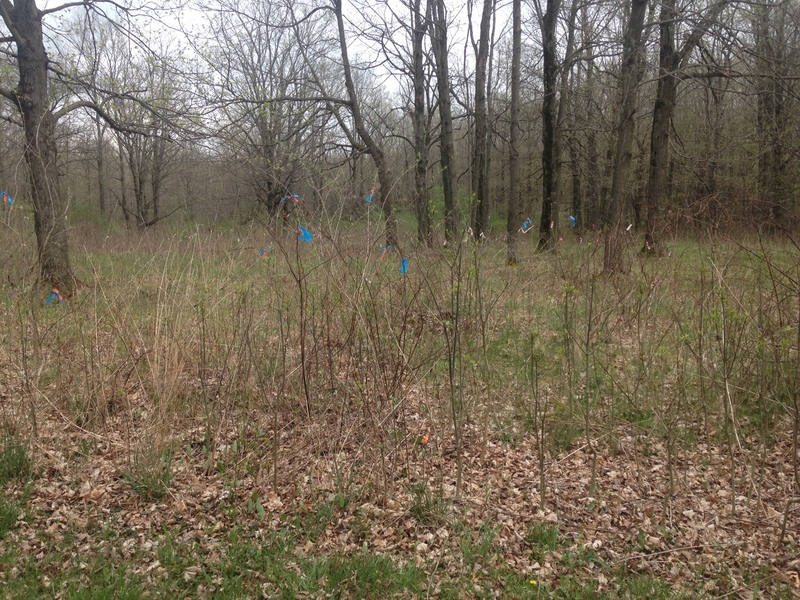 Caption: About half of the honeysuckles that had been basal bark treated with herbicide in the fall of 2017 leafed out the following spring. With a proper application style, all of the ones treated with at least 10% Relegate emulsion eventually died, but it took nearly a full year for some of them. We repeated the treatment types and application styles in the spring of 2018, to see if treatment timing matters. When we checked on our plots this fall (6 MAT), nearly all of the roses were dead regardless of treatment type or application style. 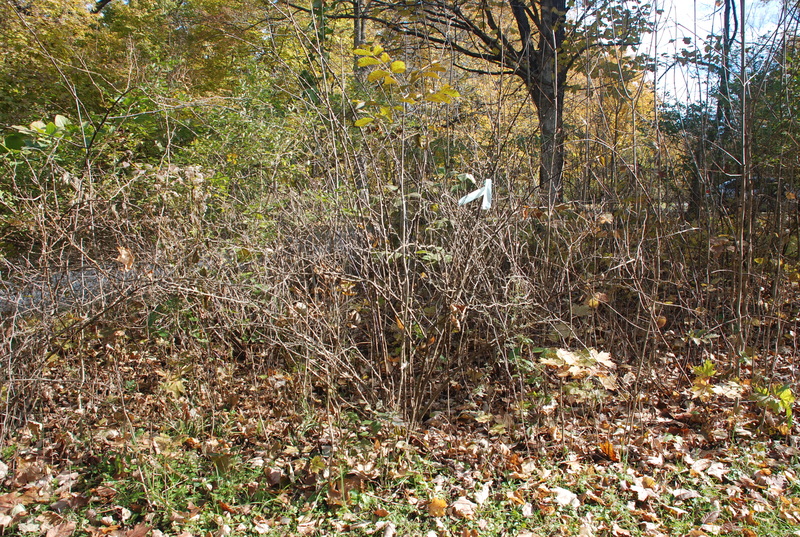 Nearly all of the honeysuckles and other shrubs were dead that were treated with a 360 degree application with at least 10% Relegate. Less than half of the ones that were treated contractor-style with an emulsion with at least 10% Relegate were still alive. More honeysuckles that were treated with only 5% Relegate were still alive than those treated with a higher concentration of herbicide. It will be interesting to see how many of those still alive succumb to death in time – we’ll check them in the spring for a final verdict. Caption: Some honeysuckles that were basal bark treated in the spring of 2018 are still alive the following fall. Have they shaken off the herbicide application, or are they on a very slow road to death? Only time will tell. As a general observation, there were still dead zones from the overspray of the oil-water emulsions for both the fall and spring treatments, although it seemed to be a little more diffuse than with the straight oil basal bark treatments. There were scattered sprigs of herbaceous plants that were not killed by the overspray in the emulsion treatments. I’m interested to reduce the amount of oil in the emulsions even further to 15% or 10% and see if those treatments are still effective. Using a contractor-style basal bark treatment to kill multiflora rose is wonderful! Oil-water emulsions work for basal bark treatments, and they are cheaper and put less chemical in the environment than straight bark oil. Walking all the way around the shrub to get a 360 degree application is important for bigger shrubs (>10’ tall), but does not appear necessary for smaller ones. It sometimes took a full year for the shrubs to die, so be patient. With a proper application style, all of the ones basal bark treated with at least 10% Relegate succumbed to death. Note: special thanks to Phil Solatka with Archer Pines Landscaping for giving me the idea to try oil-water emulsions for basal bark treatments. Caption: Another dead multiflora rose from the basal bark treatment. This entry was posted in Uncategorized and tagged basal bark, emulsion, honeysuckle, invasive brush. Bookmark the permalink. Bill Kleiman here: We tend to buy a 15 gallon drum that is partially filled with 10 gallons of basal bark oil that is colored red. Then we open a 2.5 gallon jug of Garlon4 and pour it in. Cover and shake it to mix. Install a pump and fill used 2.5 gallon Garlon 4 jugs that are marked RTU, Ready To Use. Also, at the blog site, search the word “basal” and some related posts should come up.